A die-hard Elvis fan visits Graceland on the anniversary of the King’s death and confronts the eternal loneliness of her icon . . .
Blue Moon Over Memphis is a stark and beautiful meditation on loneliness, with numerous textual and musical allusions to 20th-century popular song. Judy is a lonely, middle-aged woman, and a devout Elvis fan. She makes a pilgrimage to Graceland on the anniversary of Elvis’s death, but she is forced to wait outside, due to the overwhelming crowds. Her dream shattered, she is left to re ect on her life, through the verbal imagery of popular song. But then, during the candlelight vigil, a mysterious man lets her into the Meditation Garden where Elvis is buried, and there, under the light of a blue moon, she encounters a spirit. American playwright Deborah Brevoort wrote her 1993 version of Blue Moon Over Memphis to follow a traditional noh structure, but it was otherwise conceived to be performed by Western actors, largely in a naturalistic style. 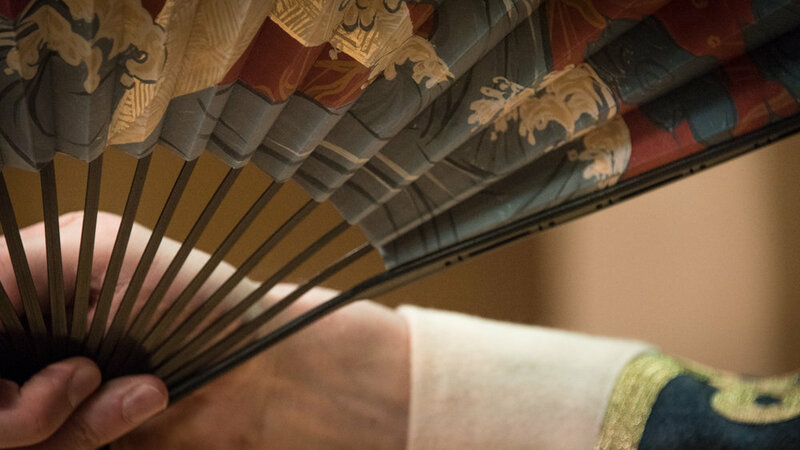 However, with the assistance of Richard Emmert, she has reworked the play poetically to be danced and sung by noh-trained actors in the style of a mugen-noh. Blue Moon Over Memphis was developed in part with assistance from the Orchard Project, a program of The Exchange. Friendship across battle lines during America’s devastating Civil War . . .
Playwright Elizabeth Dowd and composer David Crandall reimagine the conflict at the center of American history as Japanese noh, creating something unprecedented: an intertwining of voices from our country’s painful past with noh’s poetic forms, a synthesis of the extraordinary music of noh with choral concert music, accompanied by violin, harmonica, and the drums of noh. Through this synthesis Gettysburg gives audiences an opportunity to consider the larger and lasting significance of America’s war against itself.